Everyone loves a good Shepherd's pie. This version is a modern take on it whereby vegetables are the hero. By adding Turmeric to the cauliflower mash, not only does it bring a beautiful yellow brightness to the dish, but it also brings powerful anti-oxidants and anti-inflammatory fighting nutrients making it an extremely well-rounded dish. To make the cauliflower mash, steam cauliflower as per your usual method. I like to use a steam oven or boil it on the stove for 10-12 minutes. Once cooked, transfer cauliflower into a blender without any of the cooking liquid. Add the almond milk, turmeric and salt and blend for 60 seconds until smooth and creamy. Whilst the cauliflower is cooking, you can prepare the vegetables. In a large pan heat the olive oil on a medium heat. Add the leek, onion and celery and sauté for 5-8 minutes until soft. Add the garlic and stir for a further minute. Add all the vegetables and allow to cook down for 15-20 minutes, stirring occasionally to ensure that all vegetables are cooked evenly. Season with salt and pepper. Add the tinned baby tomatoes and tomato passata and stir to ensure all vegetables are coated. Bring cause to the boil and then add the silverbeet. Allow it to cook for a further 2 minutes. Transfer the vegetables into an ovenproof dish and top with the mashed cauliflower. 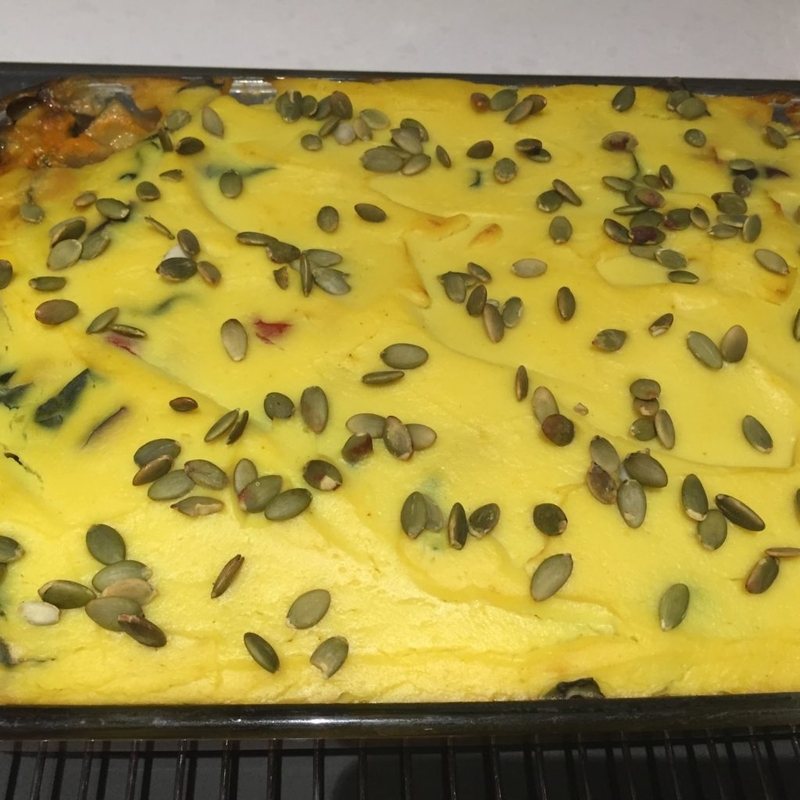 Sprinkle the top with the pumpkin seeds and then bake in the oven at 180 degrees for 45 minutes uncovered however keep an eye to ensure that it doesn’t burn. You may need to cover with silver foil. Variations: To add some more protein to the meal you can add beans, lentils or chickpeas as you are cooking the vegetables.